LAREDO, Texas-(BUSINESS WIRE)- February 28, 2018-International Bancshares Corporation (NASDAQ:IBOC), one of the largest independent bank holding companies in Texas, today reported annual net income for 2017 of $157.4 million or $2.36 diluted earnings per common share ($2.38 per share basic) compared to $133.9 million or $2.02 diluted earnings per common share ($2.03 per share basic), which represents a 17.6 percent increase in net income and a 16.8 percent increase in diluted earnings per share over the corresponding period in 2016. Net income for the three months ended December 31, 2017 was $45.2 million or $.68 diluted earnings per common share ($.69 per share basic) for the same period in 2016, compared to $35.5 million or $.53 diluted earnings per common share ($.54 per share basic), representing an increase of 27.3 percent in net income and a 28.3 percent increase in diluted earnings per share. Net income for the year ended December 31, 2017 was positively impacted by a decrease in the provision for probable loan losses compared to 2016 and a tax refund received in the second quarter of 2017. The provision for probable loan losses decreased as a result of a decrease in the historical loss experience in the commercial category of the allowance for probable loan loss calculation. Net income was also positively impacted by a tax refund of $4.9 million received in the second quarter as a result of an amended tax return for the 2012 tax year. 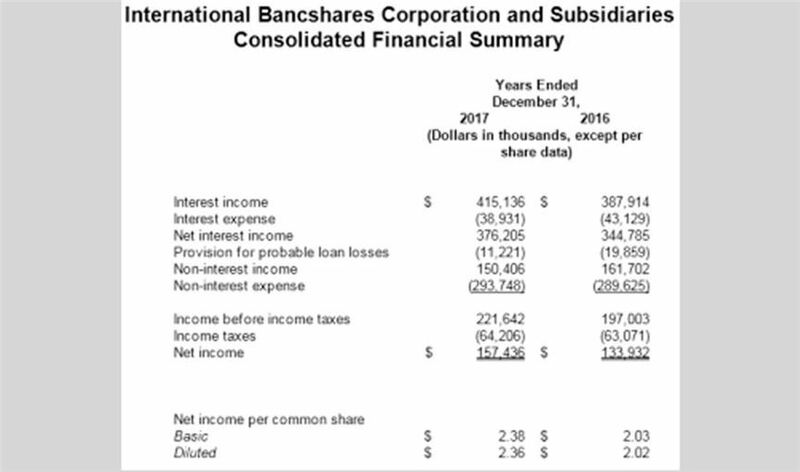 Net income for the year ended December 31, 2017 was negatively impacted by a charge of $5.8 million, $3.7 million after tax, taken by the lead bank subsidiary in connection with the termination of its long-term repurchase agreements outstanding in order to help manage its long-term funding costs, recorded in the first quarter of 2017. "I'm pleased with the Company's exceptional earnings success for the quarter and year ended December 31, 2017. We have a proven track record of success and continue to achieve earnings that exceed the majority of our peers based on Bank Holding Company Performance Reports compiled by the Federal Financial Institutions Examination Council, and are confident in the strength of our balance sheet and our strong capital position," said Dennis E. Nixon, President and CEO. Total assets at December 31, 2017 were $12.2 billion compared to $11.8 billion at December 31, 2016. Total net loans were $6.3 billion at December 31, 2017 compared to $5.9 billion at December 31, 2016. Deposits were $8.5 billion at December 31, 2017 compared to $8.6 billion at December 31, 2016. IBC is a multi-bank financial holding company headquartered in Laredo, Texas, with 192 facilities and 294 ATMs serving 87 communities in Texas and Oklahoma.